The recent hype about Iran’s nuclear program culminated last week when originally the London Times reported a loud blast heard all over Esfahan on November 28 which was then widely re-reported and denied by Iranian officials. It wasn’t an accident, Israeli sources immediately claimed. This story and reports of a huge explosion at a military base near Tehran last month which killed at least 17 members of the Iranian Revolutionary Guards including a high-ranked General, satellite imagery of the devastating blast; now the shooting soft landing of an American drone in eastern Iran and its presentation yesterday; is this in the middle of cold war or has it been stepped-up already? 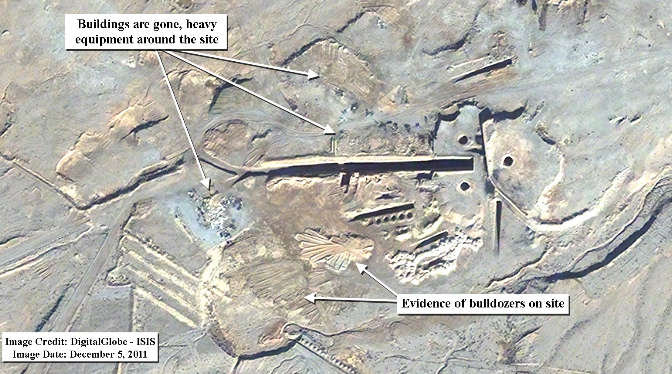 Washington’s International Institute of Science and Security (ISIS) and its director David Albright have provided us with old (1996, August 2011) and new satellite imagery (December 5, 2011) of a site near Esfahan’s uranium conversion facility (UCF). In the latest images buildings have been razed, areas bulldozed and “heavy equipment” is seen all over the site. 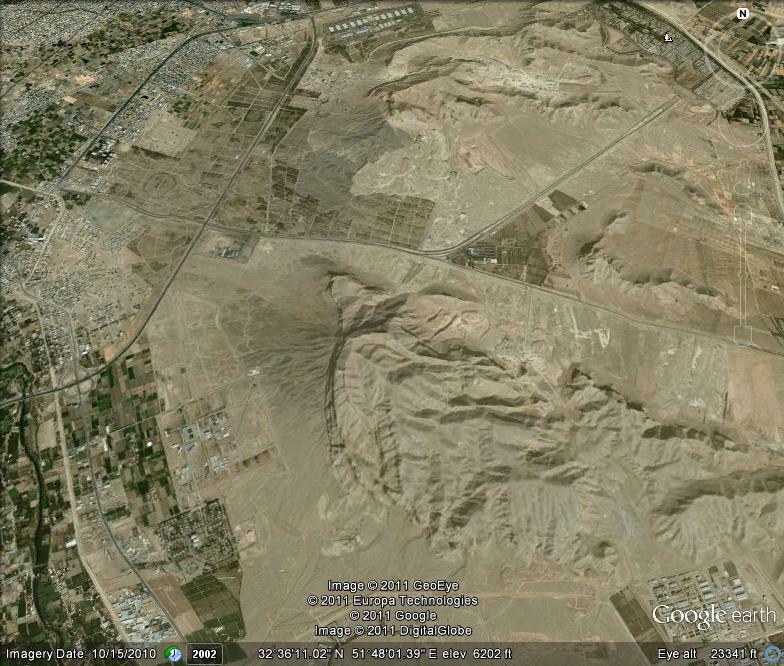 I have identified the site in Google Earth (October 15, 2010). It lies 2300 meters west to the UCF, at the southeastern foots of a hill or mountain. It measures 300 meters times 200 meters, about 0.06 square kilometers. 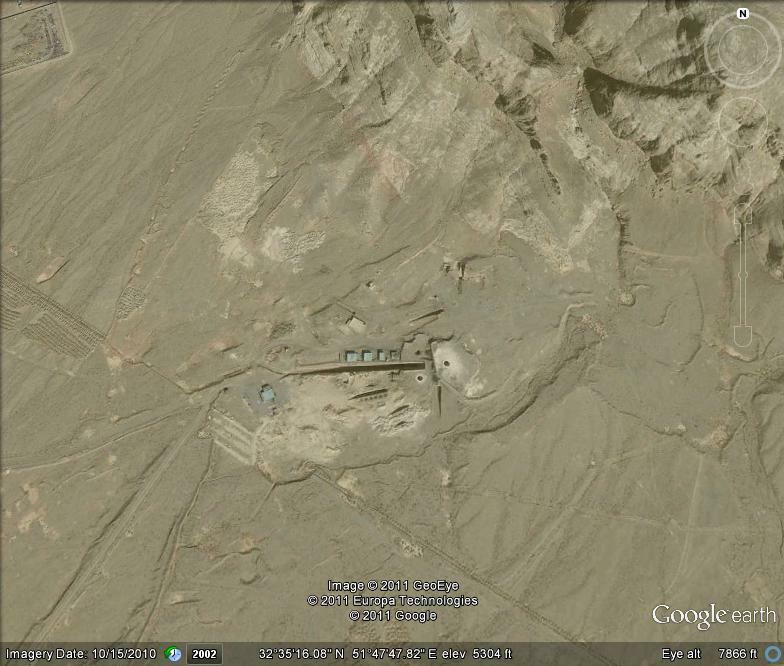 There had been five buildings on the older images visible, and something what Albright interprets as “a ramp leading to a underground facility” (“It is unclear what Iran stored in this underground facility”). I had reported on the tunnel system of the UCF in a previous post, see here. The new imagery doesn’t look like an explosion site. The razed buildings are just razed, the bulldozed area seems not be related to a crater. In fact it seems be unrelated to the buildings. The “ramp” is intact. It just looks like a deconstruction site, see here. What amazes me is the fact that the site is about 6 km distant to the Islamic Azad University in Khorasgan which hosted me a couple of years ago. The blast must have been heard there. The distance to the Esfahan’s city center is 15 km. Last update December 10, 2011. This entry was posted in Iran and tagged cold war Tehran military base blast, David Albright, drone shoot down, Esfahan blast, ISIS, Khorasgan Islamic Azad University, uranium conversion facility. Bookmark the permalink.